OK folks, I have a wee bit of a confession to admit to here.....nothing serious, but I discovered today that I have been quite remiss in sharing one of my favorite "free" GM Resources. My go-to random table generator has always been Tablesmith. This is the program I use as a basis of measurement for everything else. 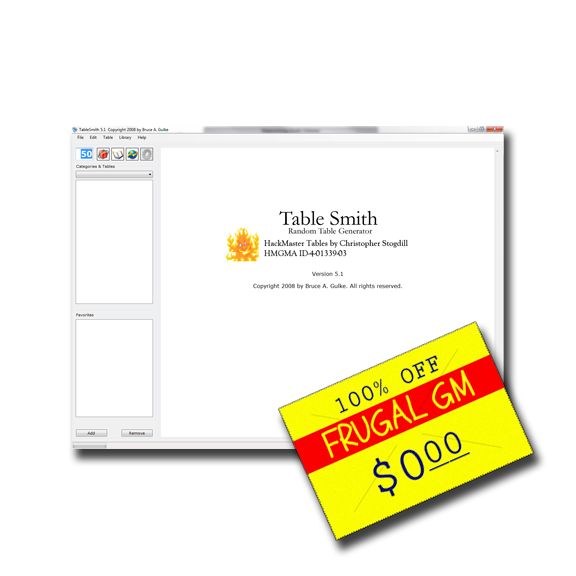 Tablesmith is a shareware program designed by Bruce Gulke (nice guy) and is $10 to register if you like the program. I registered what feels like a bazillion years ago and have been happily plugging away at it since. If you have any familiarity with the program, or get some from downloading it, you'll notice my start-up screen is different. Back when I was making a LOT of tables for use with my 4th Edition HackMaster game I went and changes the start-up screen. I found that making tables with Tablesmith was a breeze. The "language" is easy to use and file maintenance is easier than in most programs I've tried. Create folders for your tables, as in windows folders, and they show up as categories in the Tablesmith interface. The tables themselves are simple text files saves as .tab files and can be created/edited in any notebook program. As much as I've used Tablesmith over the years I know I'm just scratching the surface.....and I'm OK with that. The only thing that might make me use a different program more would be if Bruce releases Tablesmith for Android and/or IOS. I'd love to be able to create tables on my desktop and import them to my portable devices.